This list contains the Best Young Players from the Ligue 1 2013/14 season. Note that the players that qualify as ‘young’ are those that were 21 at the start of the 2013/14 season. Toulouse have been blessed with two good young keepers, Ahamada’s drop in form say Boucher take over for the latter part of the season. Toulouse won’t be too proud of their campaign but they’ve once again secured a safe mid-table position with Ahamada in between the posts. He kept 5 cleansheets in his 21 games in the first-team, conceding 26 goals in that period. While he was a solid keeper to have in the side, Toulouse’s early Coupe de France exit at the hands of 4th division side, AS Moulins prompted manager Alain Casanova to make the change. But Ahamada can take a lot of positives from the season, and with a goalkeeper as your manager, he couldn’t be in better hands. At just 20, Samuel Umtiti has once again surprised many with his confident & mature performances. Lyon won’t be in the Champions League next season, which is a disappointment, but Umtiti is one of many young positives they can take from this campaign. Lyon have consistently been flirting with the Champions League spots without overly impressing but Umtiti has been solid at the back. The side have kept 9 clean-sheets with Umtiti a part of the back-four including the impressive win over Paris Saint-Germain. He formed a good partnership with Milan Bisevac in the back-four and has been gaining some good experience from the Serb. Umtiti has averaged nearly 2 tackles per game in the Ligue 1 this season and an equally impressive 2 interceptions per game. Samuel Umtiti also featured in our list of Best Young Players to Watch-out for in 2014, coming in at #12 in our list of defenders. The youngster also featured in our #TalentRadar Team of the Week for his performance against Lille. For a detailed Scout Report on Samuel Umtiti, head this way. 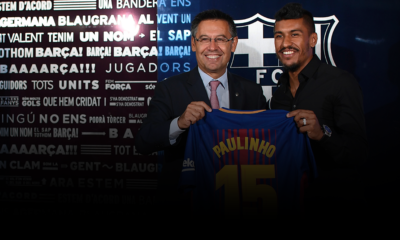 The Brazilian had built a reputation for himself in Serie A with Roma, and despite being in his teenage years, came with huge expectations, if for nothing else, then for purely the price tag he brought to the French Ligue 1. Although he has failed to nail down a regular starting berth at the club, a near impossible task with the pool of talent available at the capital club, he has performed consistently well showing his ability to handle the pressure. Marquinhos was a regular in PSG’s Champions League campaign, and was thus subject to constant rotation of squads by Laurent Blanc. He scored his first PSG goal early in the season vs Toulouse and has averaged a good 1.6 tackles per game and nearly 2 interceptions per game. Marquinhos has also been a part of PSG’s domestic cup campaign as they have the Coupe de la Ligue final to look forward to before securing the league. Marquinhos also featured in our list of Best Young Players to Watch-out for in 2014, coming in at #4 in our list of defenders. The young Ivory Coast international has arguably been one of the best performers in the Ligue 1 this season as he has evolved from a right-back to nearly an attack-minded right-winger as the season has progressed. Serge Aurier has developed into a superb footballer this season, which has even seen him captain his side. He has proved to be a versatile player, playing even at centre-back and right-wing in addition to his regular right-back role. Serge Aurier has played each and every minute of each and every game that he has been available for, missing games only through suspensions. It’s remarkable that playing at right-back, Aurier has been involved in 13 of Toulose’s 41 goals so far. That is more than 31% of the teams goals. His unmarked runs into the box from wide areas have been deadly, and a testament to his attacking nature. Serge Aurier has featured in our #TalentRadar Team of the Week on three occasions (a joint record), firstly for his performance against Reims, following that up with a good showing against Rennes and then captaining his side against Lille. He was also at #10 in our list of Best Young Players in the month of March. Kurzawa is one of many young footballers that AS Monaco have utilised as they returned to the first division, proving they aren’t all about expensive World class players. Apart from a couple of injuries, Kurzawa has been a regular starter at left-back in Claudio Ranieri’s side. With Monaco employing a 4-3-1-2 formation on plenty of occasions, Kurzawa has been the only real attacking threat down the left, while also having to stump up in defence. The youngster has been among the goals as well, scoring five, two of which have come late on, earning his side valuable points. Kurzawa is often seen in places in the box you wouldn’t expect a left-back to be and has also scored twice from his head. His reading of the game has been immense, averaging nearly 3.5 interceptions/game which is more than most centre-backs. The Italian has attracted attention ever since his move from Italy into the city of Paris. 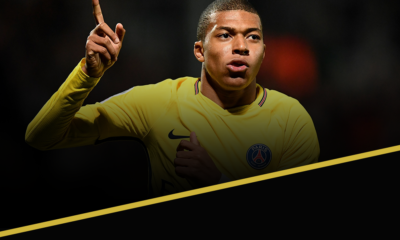 Plenty of top clubs have shown interest in him, including the likes of Juventus, and this season he proved why, occupying an important position in PSG’s solid three-man midfield. That PSG midfield has received a lot of praise, Motta has been the focal point with Matuidi the most attack minded player. 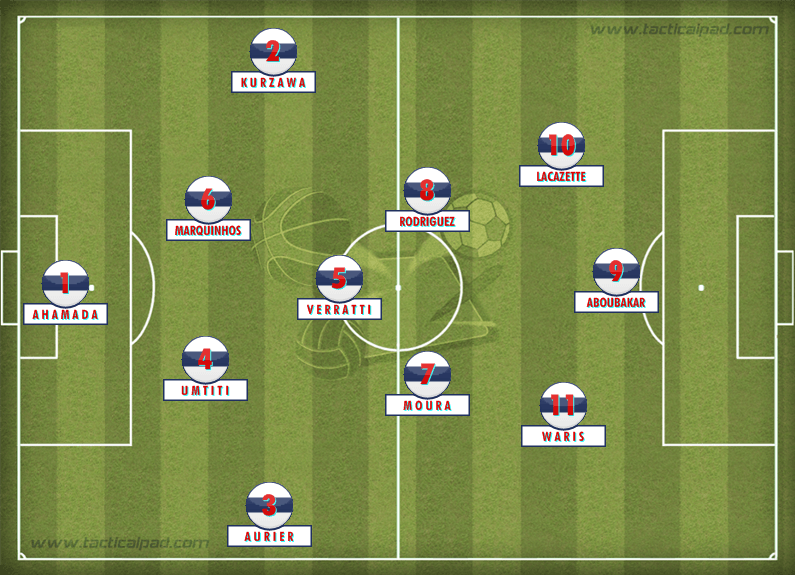 Verratti thus is important to provide the balance and has done a good job on the right side of central midfield. Blanc has thought his midfield to retain possession and Verratti has learnt well, averaging a 92% passing success rate. He also averages nearly 2.5 tackles per game. Thus Verratti is deployed to not only retain possession but also with the duty of regaining it. His performances have kept Yohan Cabaye out of the side as the ex-Pescara man goes through another 40+ game season. Here’s a detailed Scout Report on Marco Verratti. The Brazilian youngster turned heads after opting to join PSG despite being linked with some big clubs. He has found it hard to nail down a place in PSG’s first team but has taken the chances that have presented themselves. Lucas Moura has been a part of PSG’s line-up for each and every game in all competitions this season but has started only 50% of them and the remaining have seen him come off the bench, barring two games. He has been instrumental in providing pace down PSG’s flank with an average of 2.8 dribbles per game. It has seen him assist nearly 15 of PSG’s goals in all competitions but has only three goals to his name. 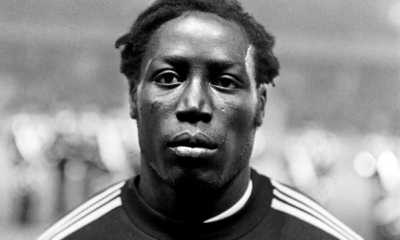 Though he nearly scored one of the greatest goals in French domestic football history vs Marsellie, only to be denied by a goal-line clearance. He is the third highest assister in the entire league, beaten only by Zlatan and the next player in the list. One of the biggest names in the Ligue 1 at this moment in time, James Rodriguez has lived up to expectations and has led Monaco into a fascinating first season after claiming promotion. James Rodriguez has been a stand-out performer in Ligue 1 and if it wasn’t for the exploits of PSG’s Zlatan Ibrahimovic, he could be considered the best player in the league as well. He has been involved in nearly 40% of Monaco’s league goals this season, scoring 9 (second highest top scorer for the club) and 12 assists which puts him as the second best assister, behind that Swede. He has averaged more than 2.5 shots per game and 2.5 chances created per game, while also finding the net with some long range free-kicks and shots. 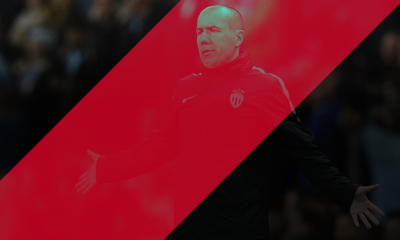 He has played in majority of Monaco’s games and has been the main source of creativity in that 4-3-1-2 formation. James Rodriguez has featured a joint-record three times in our #TalentRadar Team of the Week. First he was recognised for his first ever brace in French football vs Bastia, and then in his role in the big 3-2 victory away to Lyon and most recently for his performance vs Nantes. Lacazette has been phenomenal this season and is another one of those young players who would have been leading the charts if it weren’t for the riches of PSG. He has led Lyon this season, almost single-handedly in attack. With 14 goals to his name, Lacazette is the joint third highest scorer in the Ligue 1, beaten only by Zlatan Ibrahimovic and Edinson Cavani, and he looks unlikely to climb higher. With 2.5 shots per game, Lacazette has proven to be a night-mare for defenders, constantly moving and active around the box. The striker showcases immense composure on the ball and combines that with his ability to get past on-coming defenders. He has been touted as a talent for some seasons but the 2013/14 campaign proved to be the season where everyone took notice. You can read a report on Lacazette’s brilliant brace scoring performance against Bastia here and here’s a more detailed Scout Report on the Lyon man. The Lorient No.9 who made the jump from Valenciennes this season has been having a remarkable campaign, tied with Lacazette in the scoring charts and thus another victim of the PSG dominance. Of the 33 games Lorient have had in the Ligue 1 this season, the Cameroonian has been available for selection 32 times and has played each and every minute of those 32 games. He has been the crucial player in Lorient’s campaign as they are securing another safe mid-table position. Aboubakar is blessed with a good upper body strength, possesses raw pace and is brilliant in finding space & getting in behind the defenders with his runs. With 2.6 shots per game, he has proved why he is right up there in the top scorers table. The man on loan from the Russian Premier League has been a revelation in the French Ligue 1, and a rare bright light in a rather dismal season for Valenciennes which looks set to end in relegation. The Ghanaian joined Valenciennes only in the January window, arguably to fill the void left by Vincent Aboubakar in the previous window, and has scored 9 goals putting him among the top scorers in the second half of the season. He isn’t shy to move out wide and play as a winger but is also good with the ball at his feet in and around the box. He has also scored two braces, the first was in Valenciennes’ exciting 2-2 draw with Sochaux and the other was in a losing effort vs Ajaccio. His performance vs Nice helped him feature in the #TalentRadar Team of the Week. For all our Talent Radar articles, head this way and here’s #TalentRadar on twitter.